It has been my privilege to read the manuscript for Dr. MacLachlan’s new book. The book is now available and can be ordered on Amazon for a moderate price. 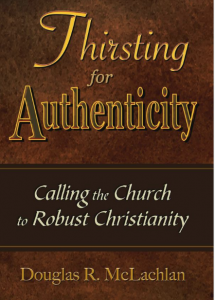 There have been many books written on the condition of the church in today’s culture. Many are good and helpful and many fall short of being a biblical point of view. Dr. McLachlan takes the reader through passages of Scripture by solid exegesis and lets its light shine upon the church and the culture. The first section is titled, “Resetting our Rudder in a Postmodern World.” Here McLachlan focuses on the world in which the church resides and how it is affecting the church’s walk with God. The second and longest section is, “Reaffirming the Essentials at the Center.” These seven chapters emphasize Christ, Scripture, the cross, the gospel, the great commandment, the great commission, and the glory of God. If you like exegesis you will like these chapters as McLachlan walks through verses and passages with context, grammar, explanation and application. This is what makes this book stand out among the rest in dealing with the culture and the church. It is hard to argue with the text. McLachlan doesn’t always point his criticisms toward the left but applies the pressure on conservatives and fundamentalists as well. The third section is titled, “Recovering Our Spiritual Vitality.” There is just one chapter here on the supremacy of Jesus Christ in all of life. The culmination of Scriptural research ought to be to make our Lord Jesus Christ truly the Lord of our lives. I don’t often make personal recommendations for books, but having read Dr. McLachlan’s manuscript, I was blessed and I’m sure you will be also if you read the published book.